Team Good had already lost the moral high ground, I'm sure you can guess how, dear reader! Anyway, we still go a fair number of turns in, even if in some cases this was because forces ground to a halt with a surreal regularity. My wizardling failed three casting commands in a row, as the second command roll of my turn each time; he never once cast a spell, my advance stalled all game as a result. Nope, it's safe in here! After a strong start Team Evil started the run out of steam, not helped by the slow advance of mine and Pauls' troops. 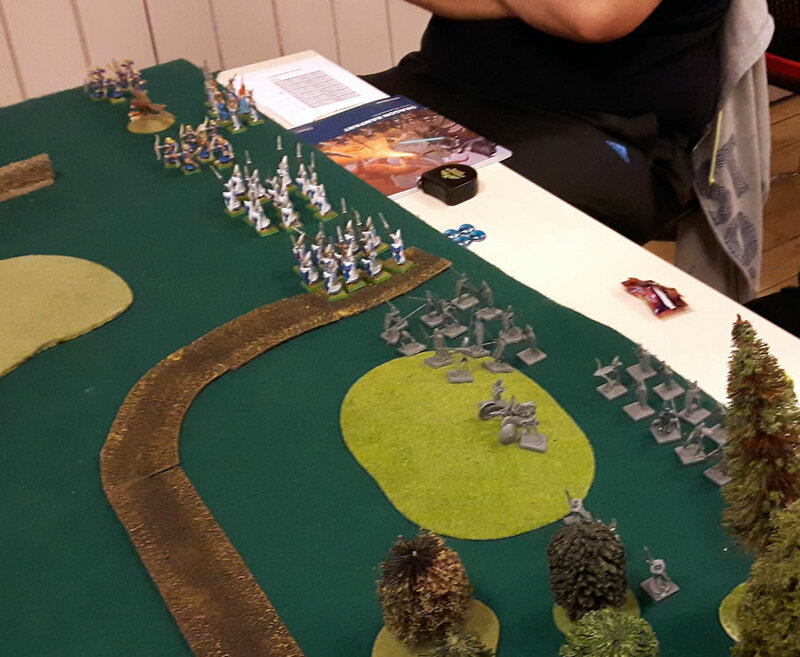 The Elves had formed a strong battleline and along with James' cavalry were using harassing fire to our great detriment. Although Team Evil, undoubtedly inflicted more casualties, it was not having the luck in routing enemy units. 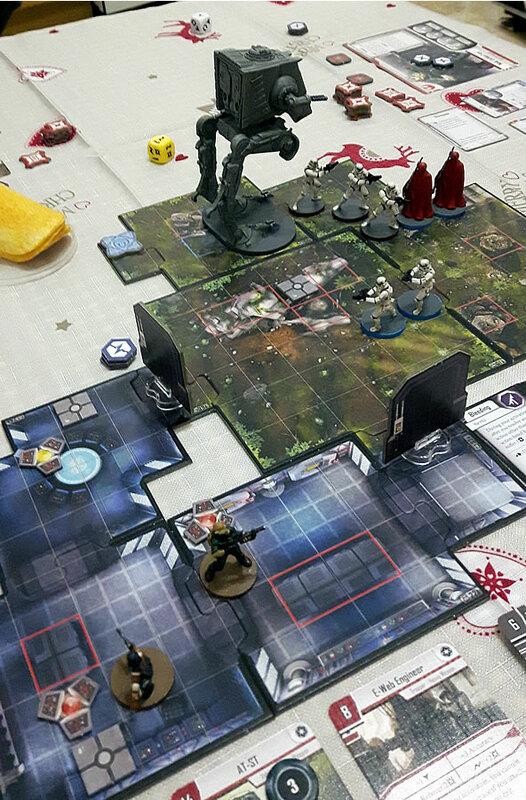 Team Good was making each hit count, even if against the Kobolds they had limited luck. At the end of our available time, on unit losses it was with the pale faced pointy eared types! However, when boasts were added to the mix the result was more in doubt. I turned out that the only person with a positive outcome for boasts was Matt, whose chosen quests proved the most attainable in the mass battle. I and a couple of Team Good were in negative equity and so at the end it was a slight moral victory again for Team Evil. A good game to end the year with, with plenty of memorable moments; Gav's airstrike eagle, Bob the Trolls hopeless bloodlust, Treehugging beastmen. Definitively the sort of experience I want from my games. Good Friends, Good Times, Good Game. 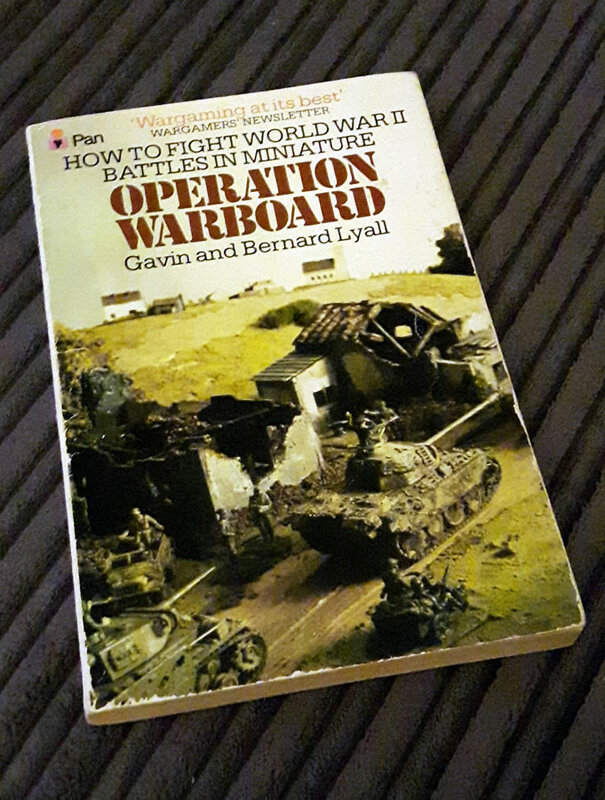 Every so often I manage to pick up one of the classics of Wargaming literature, from the halcyon days of my youth. Operation Warboard by Gavin and Bernard Lyall is one such book and I had the great fortune to pick up a copy for a mere £5 on eBay a few weeks ago. I say good fortune, for this is a book that trades hands for an awful lot more usually; AbeBooks typically offering ex-library copies for £20 or more. This one was clearly a personal copy and although read, looked to have spent most of its' life sat on a shelf somewhere. I consider I got a real bargain here. 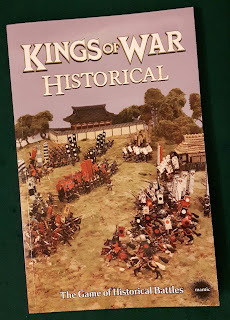 So far as I am aware this was the authors' only foray into wargaming literature, but unlike most writers in the genre (Don Featherstone excepted really) Gavin Lyall - who certainly appears responsible for most of the writing, if not the rules themselves - has genuine form, having written a number of thrillers prior to this labour of love. I cannot admit to having read any of those, but the narrative writing within the opening sections of the book gives some credence to the idea of the author as being an actual, y'know, writer. In fact one thing apart from the clear narrative action and the friendly, breezy style, is the clarity with which Lyall writes. Phil Barker and the entire writing team for Games Workshop should have taken note! 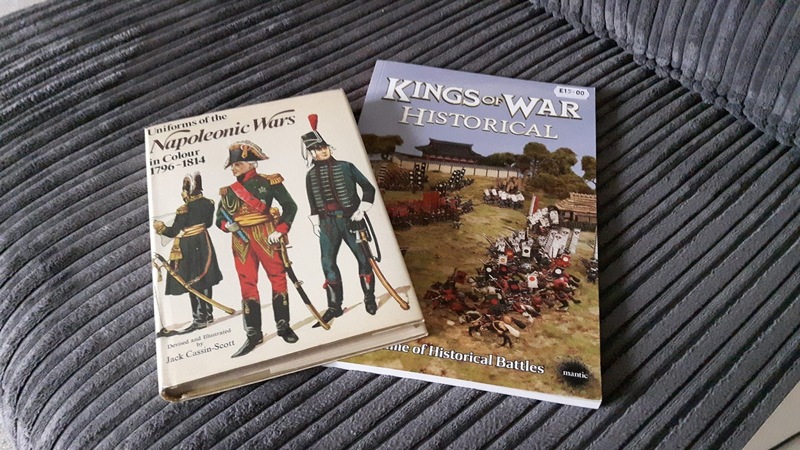 The book, rather obviously is a set of rules for fighting WW2 wargames, Lyall acknowledges the wider hobby of wargaming, but his interests are fixed to what in the time of publication was still recent history. 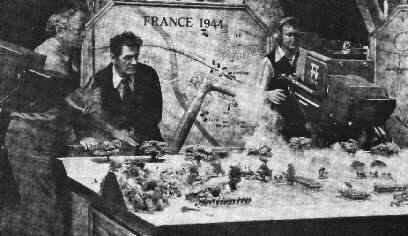 The book, as so many of its' period assumes no real knowledge of wargaming as a hobby on the part of the reader, setting aside chapters on procuring models (though not painting them, only the cover photograph suggests such effort), building a gaming space and making scenery. 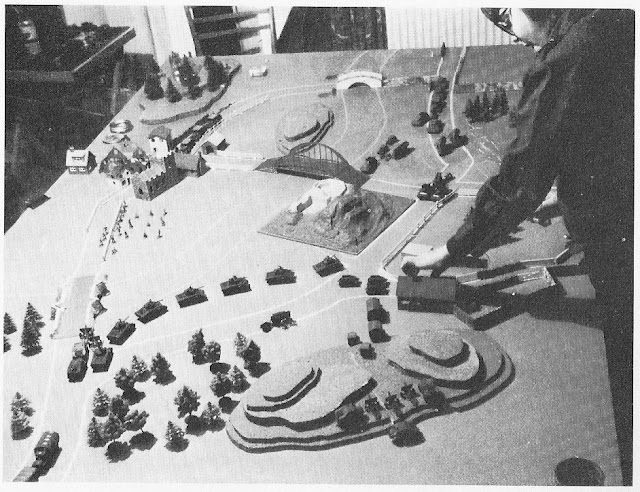 As for the history, it is from an age before the obsession with pedantic historical accuracy masking simplistic rules (I'm looking at you Flames of War/Bolt Action), The history is often fast and loose; unit sizes and available military equipment pragmatic based largely on what three or four plastic kit companies deigned to make. Sure you can squint at a photograph and declare 'that's not a Hanomag' but really it's not the point. 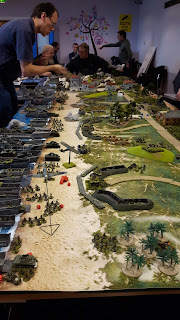 The rules themselves are certainly a product of their time, and anyone with a nostalgia for the older systems will be happy to set to work on complex machine gun and artillery grids to support play, but on other levels the rules show some evolution over simpler precedents. Lyall's vehicle rules were hugely influential on my own rules as a kid, featuring different armour values for vehicles front side and top armour - with an attack-defence system anyone playing Bolt Action will recognise (Spoiler: Lyall got there first). There are passable rules for the effect of morale on a force, and other features such as massed fire that speed up play, but in other areas things are very conventional. Alternate turns, or simultaneous with written orders (very much en-vogue at the time) for example. Also there are elements that require an honest opponent to really work, visibility rules certainly being left wide open to all forms of abuse. One of the very best aspects of the rules however, and one more systems should adopt, is the extensive section preceding the rules explaining the logic behind them, what is and is not covered and how to address the unexpected. Essentially Lyall recognised the need for an FAQ long before other rules gave the need any thought. This really helps make the games' intent clear and certainly makes it clear the style of play envisioned. If only more rules did this much. Now I can't say I'll be jumping into playing these rules any time soon, but as a blast from the past, these were certainly better to read, and probably to play than many of their brethren. I could see me electing to use these for a show for example, as a novelty! Certainly one of the better old sets out there, and the nostalgia value is undeniable. This copy will be staying in my modest collection of classic wargames books. So, I went to see the latest Star Wars movie over the holiday weekend. Very interesting. The first half draws very, very obvious parallels to the present situation in the Middle East, and muses on the million shades of grey implicit in armed rebellion; from the outset the 'Heroes' do questionable things in the pursuit of their goals. The bad guys morally justify their actions in ways that certainly sound familiar of Western military/diplomatic policy. The second half plays out like nothing so much as one of those daring-do war films we British used to make, were pretty much everyone gets killed in the steady progression of the mission. It's heroic, but tinged with a sadness that makes it clear, war is hell, but sometimes you have to fight regardless. 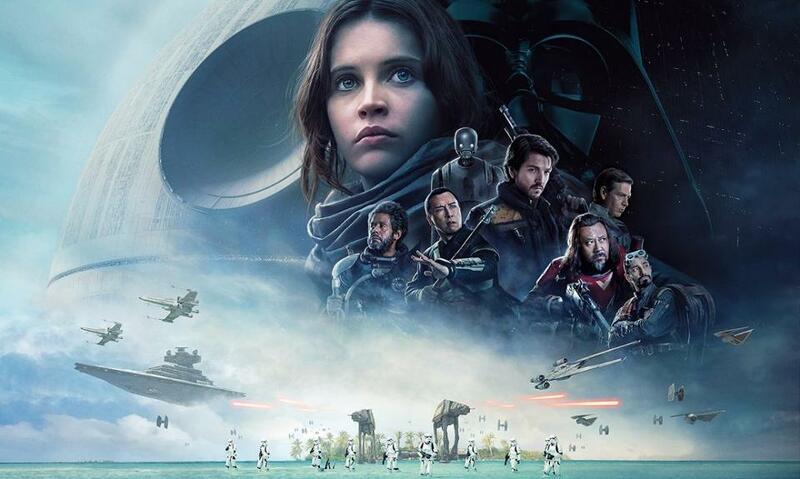 Overall the film puts the 'War' into the Star Wars franchise in a way that none of the previous films has quite done so before. It's a good movie, but it didn't throw the nostalgic joy in of last years release, and the adventurous joy of A New Hope, was definitely absent. 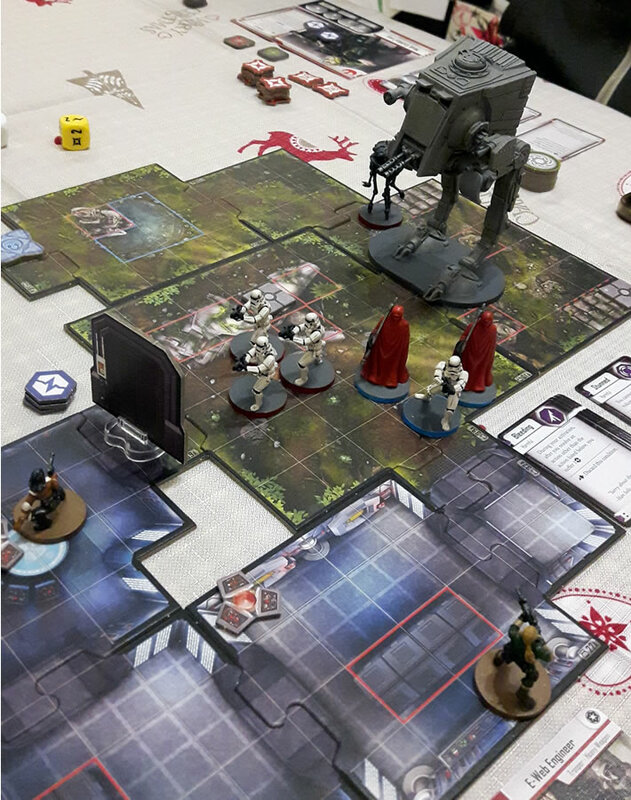 Speaking of Star Wars, after a whole frigging year we managed to get the Imperial Assault campaign going again. Jim and John took their heroes out for another run, with a task of downloading a virus to Imperial databanks. Starting slowly, they realised they had but limited time to conduct their mission and only got going with moments to spare. Once inside the Imperial position, the bulkheads fell and reinforcement, with the blessing of full access codes, soon arrived. The situation looked bleak, but they need only hold on until the 12 data drives were corrupted. Thankfully ti happened in the nick of time and as ever the rebels were able to slip away through a service hatch, by routes no stormtrooper or scout walker would ever find or follow. So it has been a Star Wars'y run up to Xmas, but what of the rest? Budget Fantasy - War Trolls! 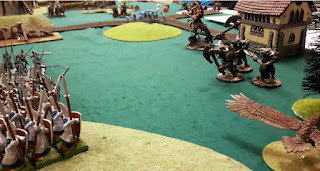 Some of my readers may be familiar with my penchant for keeping my fantasy armies to a tight budget; I'm not one for going out and spanking away £60-100 on the lastest GW model; not whilst eBay, rummage stalls and toy shops exist! Rather less may be aware of a growing range of fantasy models in the traditional 20mm toy soldier scale coming out of Russia these days, not the Technolog models I've featured before, but the models from Dark Alliance, an offshoot of RedBox models from what I can see. One of my random trawls of eBay threw up a set of Trolls they recently released, and I was intrigued. 2: These guys looked to be huge. I decided to take a chance on them and stumped up the £11 post-free an online vendor with stock wanted. Scant days later the package was in my hands. 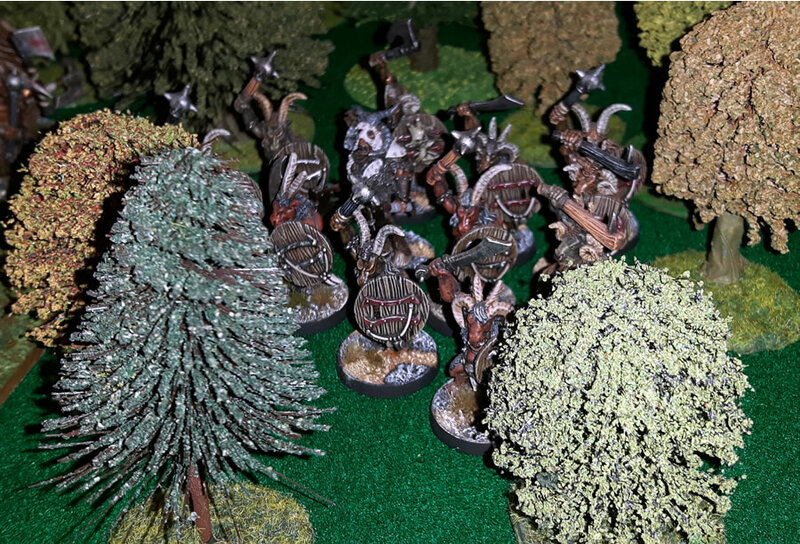 Inside were 8 heavily armed and armoured trolls in a brown plastic. Chunky is a fair description, so bendy swords and so on are unlikely to be a problem here. On first sight the detail was pretty good, some decent sculpting, though the models have a fair bit of flash to clean up. But the real question is how well they'd scale to 28mm models. By comparison to both a plastic and metal GW troll, they are almost exactly the same height, taller by a shade if anything. The poor swordsman at the front shows they are suitably imposing. So I'm pleased with my little purchase, and can certainly recommend these to others. 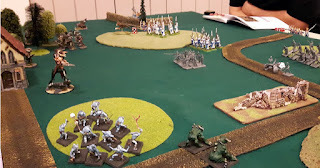 For my part 6 will join my Kings of War Orc army (in regiment stands of three), whilst the other two will go towards the retro-dungeon/Dragon Rampant project. It's also worth noting that this box was dubbed 'Set 1'; Dark Alliance has produced sets of models spread across several boxes already, and this most likely means we can expect another pack at some stage, now that would make for some nicely varied units! 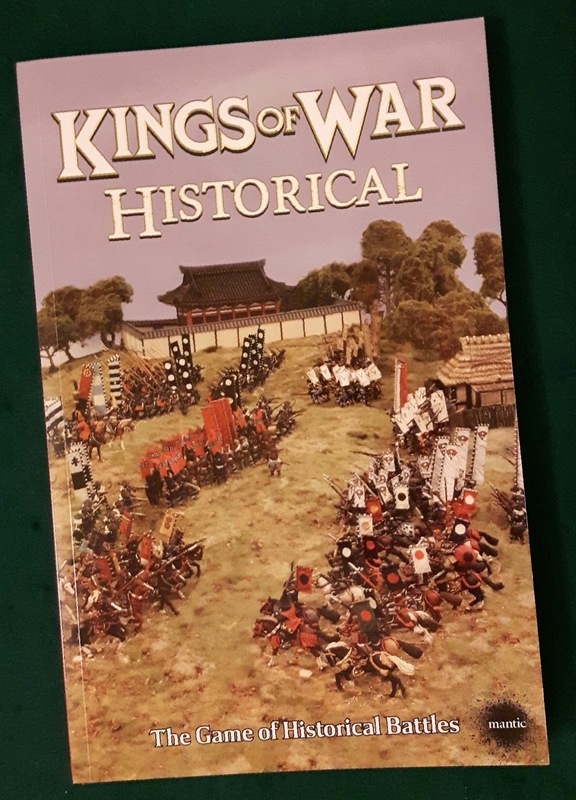 Without that much fanfare, so far as I could see, Mantic recently launched their long requested historical version of the Kings of War wargames rules. I managed to pick up a copy at a very reasonable price at Recon earlier this month, and was fortunate enough to have a game arranged shortly thereafter for which they could be put on the test bench. Hence I'm in a position to give a review of the rules. 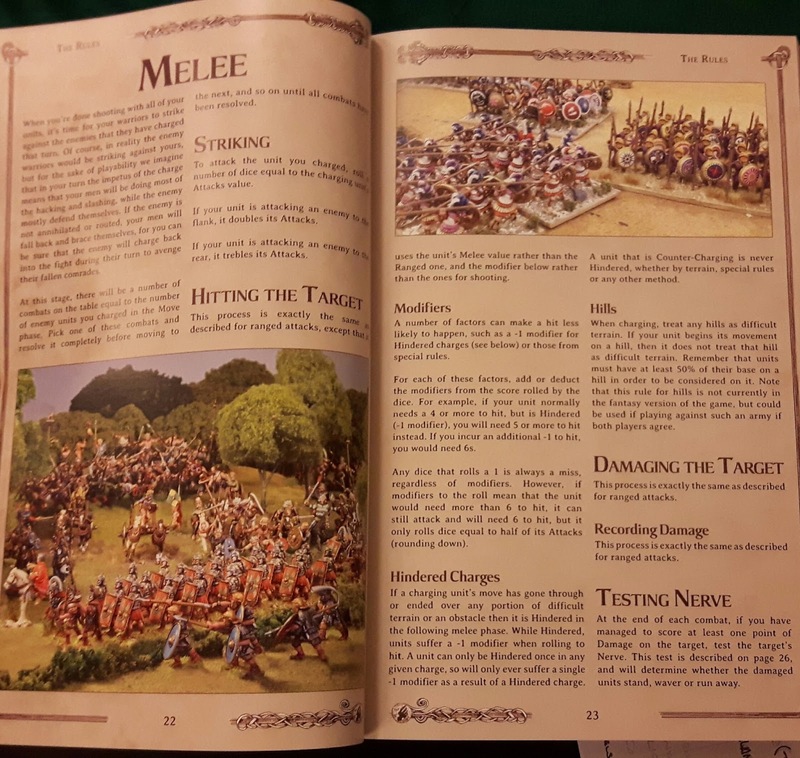 The 128 page softback book, comes with lush presentation and more importantly clear and compact rules, which by the time they reach a historical audience have already been honed over several editions as a fantasy set. 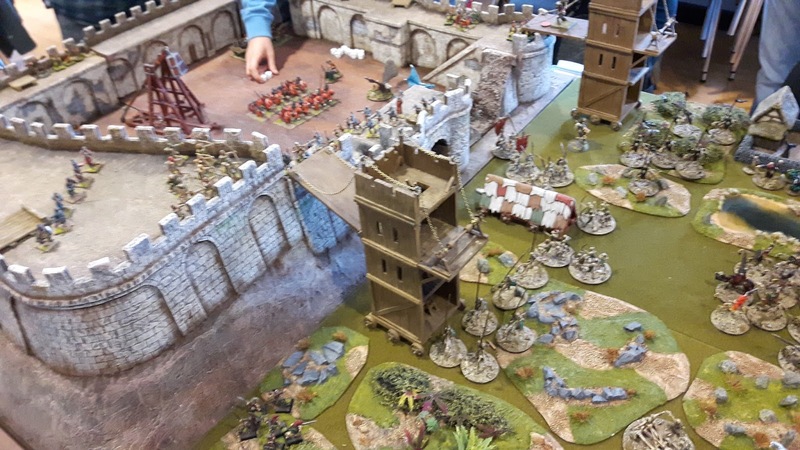 Many of the niggles that beleaguer rules systems have already been ironed out, leaving Kow:H a lean tight system that benefits from it's predecessors. Add to that the blend of generic troop types and 30 customised 'Army Lists' and the resultant package looks pretty good. It even squeezes in enough of the fantasy rules to allow mythological elements to join forces with fact. Of course all this may make the history buff, say, "ah, rules with fantasy elements? These will never reflect real warfare then!" And there are elements where that could be said to be true. But they do not make for a 'bad' game. 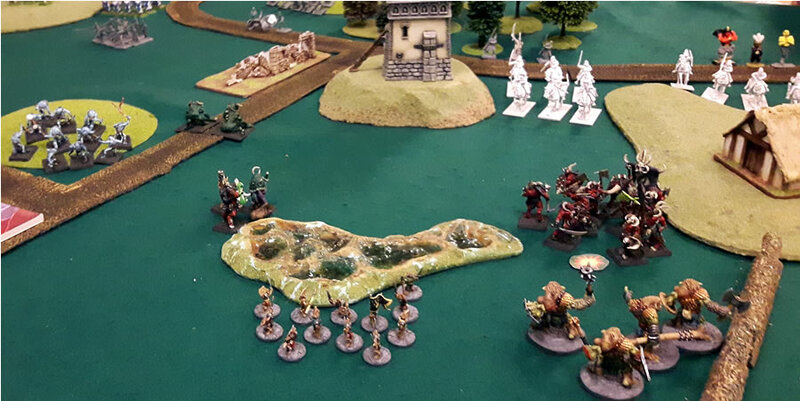 What you have here rather is a simple core system, based on alternate moves where only one player moves or rolls dice, all of the action is in the hand of one player, from movement to shooting and combat, and any resultant morale tests (referred to as 'Nerve' in Kow:H). Now that may sound one sided, but it in fact is so fast that play fair rattles along. It is engineered to kill procrastination and stems from the original systems design ethos for fast play, a large tournament game was designed to take less than 2 hours to play. Even played slowly the game is pacey, why? 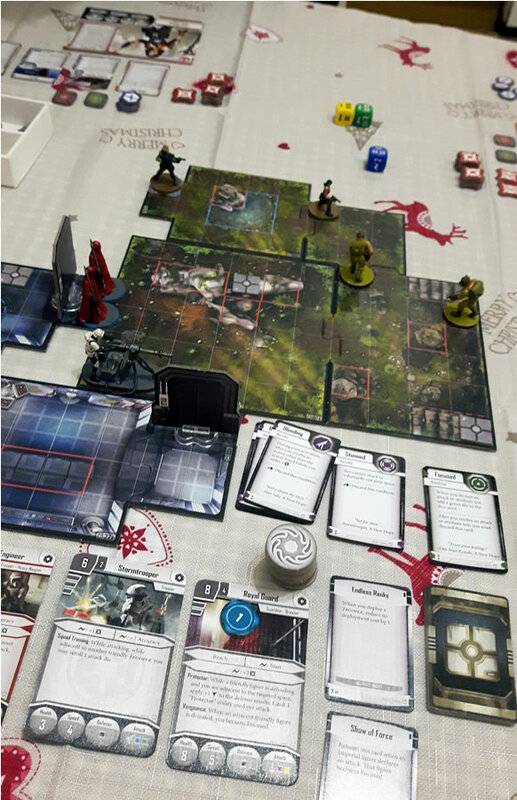 The fast-play ethos, is in effect a command and control system, especially in large games. The rules recommend using a timer for turns and there is a real point to this. You move all your units freely (once per unit of course is a limit), shoot and fight with them, but you can only carry out as many of the actions as the time permits. If your ten minutes for a turn runs out and you've not moved everything, tough! It's now your opponents go. So the rules seamlessly encourage you to play actively, and to prioritise key actions in a turn. All this said, we seldom play timed games, but it's a neat idea. This aside, you have very simple, easy to learn rule structures. Moving is by unit and is simply handled, all units are implicitly formed, and could be represented by single bases or multiple stands. 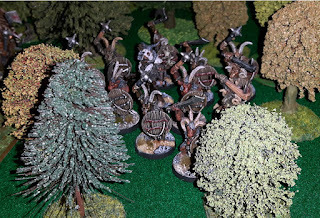 We elected to treat Skirmisher units - one of the few additions to the rules - as loosely ordered until contacted by an enemy, though the rules here do not specify any visible difference. 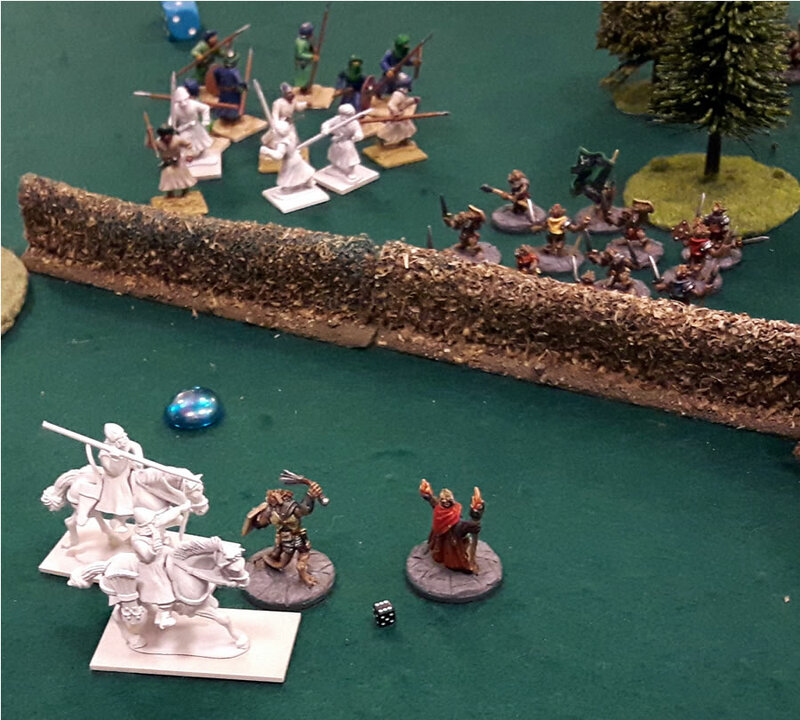 Units fire and fight with fixed numbers of D6 based on their profile, rolling against their proficiency to hit, and against the opponents defensive value to wound. There are no Warhammer or Hail Caesar-esque saving rolls. Casualties are marked as hit points on the unit, no casualty removal, and any unit suffering casualties in a turn has to take a nerve test. 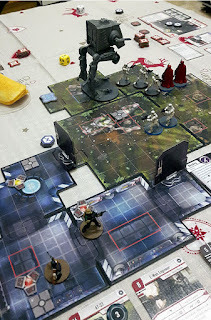 The attacker rolls 2D6 and adds the casualty number to the result, if it is equal to or above the minimum Nerve value of the enemy unit it becomes 'Wavering' for its' next turn and halts, unable to act aggressively on its' own next turn. If the result equals or exceeds a second higher value the unit routs and is removed from play. Fail to beat an opponent in combat and you recoil, not unlike DBA/DBMM, but remain locked in combat facing your foe, unless they retire. One thing that KoW:H gets right, is the element that made the fantasy game work so well. Flank and Rear attacks are deadly, and you will seek to avoid them at all costs whilst trying somehow to deliver your own. How is this handled? get on an opponents flank and your attacks are doubled; get in their rear and you can triple them. Such simple elegance means that protecting your flanks becomes crucial to the game; and battle lines with reserves form far more naturally than in many 'gamey' systems. Not that it is all perfect, and if one is being critical you can say that not everyone appreciates the IgoUgo template, and the near total control of your troops on a turn can seem too perfect, especially in untimed games. Some may also dislike the exception rules and 'special abilities' provided for some units, though in reality these are generally appropriate and well balanced; not least as few of them in isolation are terribly powerful. The biggest question, maybe a criticism in a few cases, is over the army lists themselves. Generic units are the core of each list, augmented by a handful of special units unique to the individual army; usually including a commander. These lists may raise some eybrows - for example the Egyptian list conflates the chariot armies of the Pharaohs with the cavalry led forces of the early Muslim armies, simple options like handgunners for the Japanese list are missed (though easily resolved). Overall they feel like what they are, army lists with a sincere effort to reflect some history, but not created by experts in the field. No doubt for friendly play they are easily adjusted, but they may well irk those who need every last detail pinned down. So, the good fortune of timing meant that I had an ancients game agreed to, which would present a test of the rules. Digging into my 28mm Ancients collection I was able to assemble a couple of small armies of the Peloponessian War (sorta). 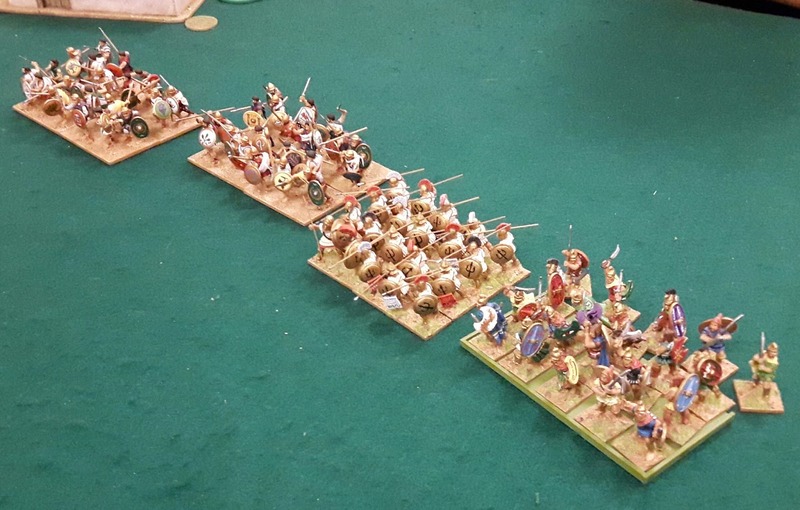 1400 points each of Spartans and Athenians. In classic fashion we deployed some classically sparse terrain, the only inconvenient element of which was the farm in the middle of my deployment zone, which split my deployment line. 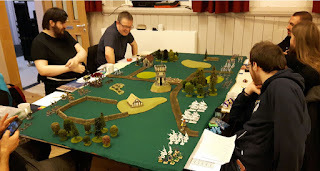 We rolled one of the standard scenarios from the rule book, identical to those in the fantasy version, and found ourselves playing the 'Pillage' rules; essentially take and hold. A simple case of occupying ground, at the end of 6 or 7 turns. 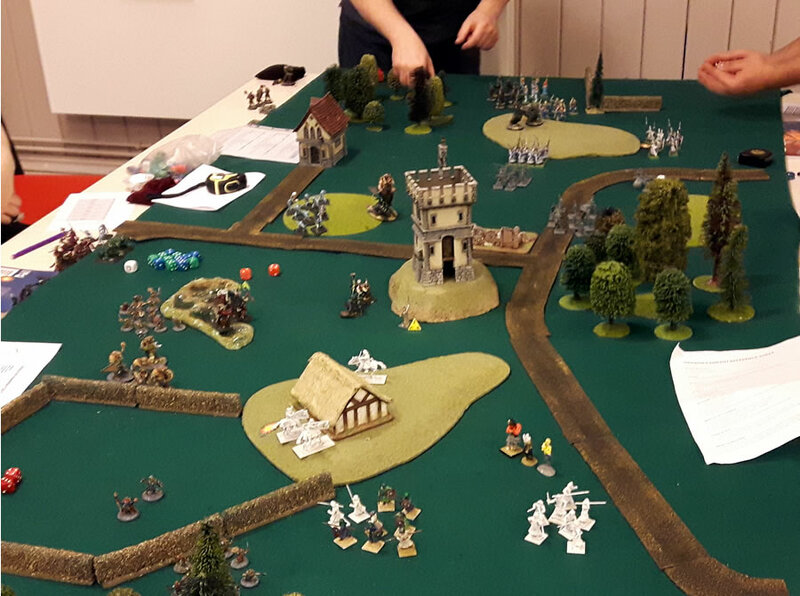 The scenario rules allow for a variable length game to ensure uncertainty, but still cap it to a low maximum - for time considerations once again. Incidentally the rules also feature two additional scenarios unique to the Historical variant. Anyway, even with a new player to Kings of War on my side as co-commander, we found the explanation of the rules straightforward. 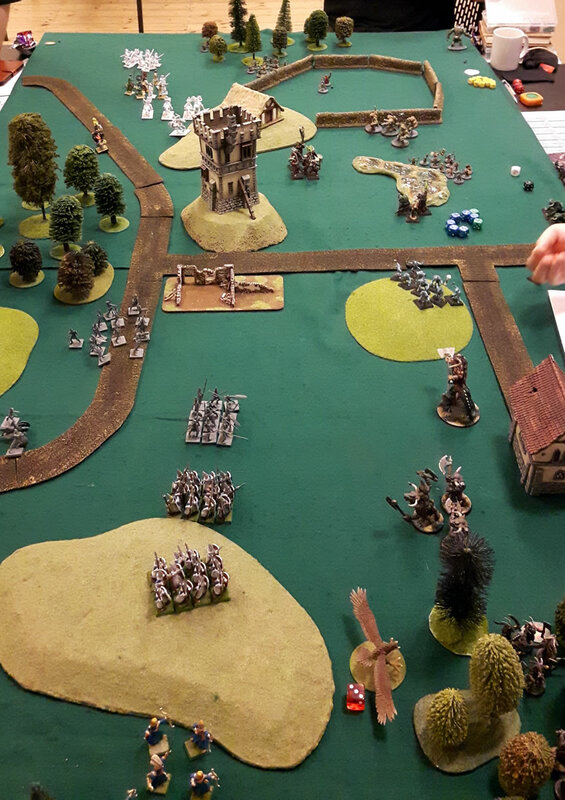 We deployed in a standard alternate unit fashion - one could equally have drawn maps and used these to deploy simultaneously. 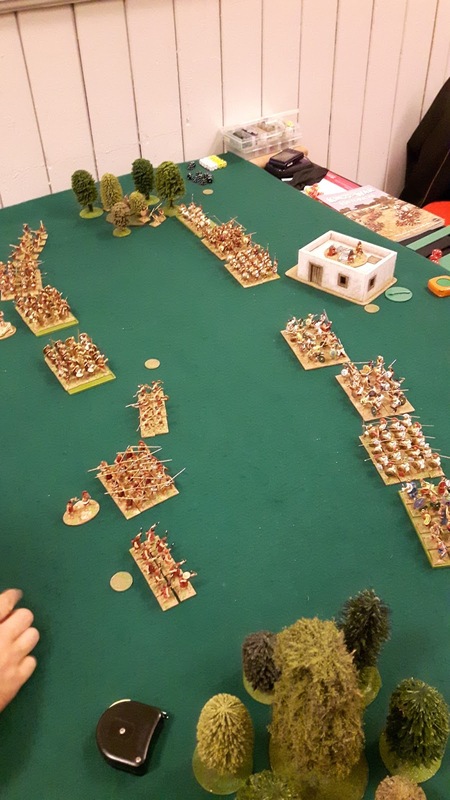 Forming plausible lines of battle; lacking the depth for reserves on the Spartan side, whilst the Athenian reserves pushed into the line as soon as the Phalanxes pushed past the farm. 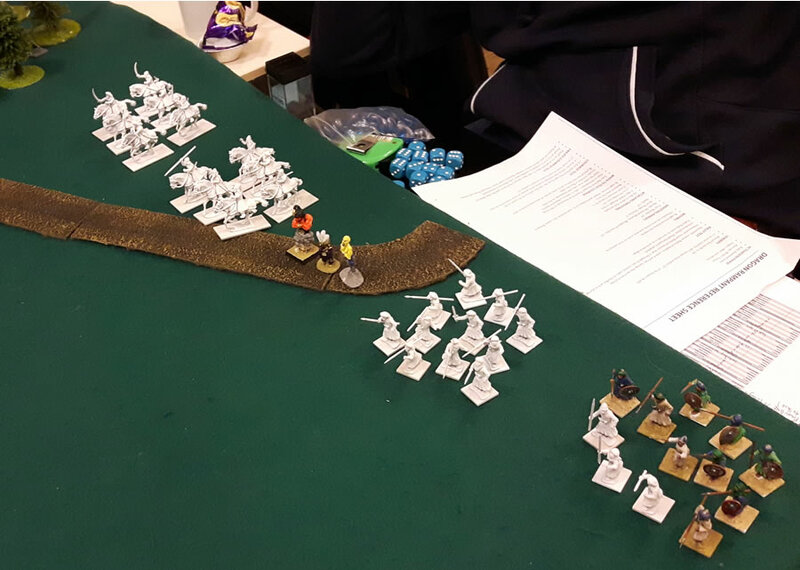 One thing you become very aware of with KoW:H, as in the original rules, is the inevitable frailty of units. They will all crumble as a result of casualties, though there may be early incidents where only a double 6 on the Nerve test - which always results in 'Wavering', and likewise a double 1 always leaves a unit with firm resolve regardless of damage - will effect. In the Athenian case, fortunately high nerve rolls on the part of our Spartan player meant that many of our skirmishers broke and ran with only a smattering of casualties. This impact is not perhaps as severe as in some other games, but it nevertheless is there, and justifiably so; there must always be room for the unexpected in this sort of game. 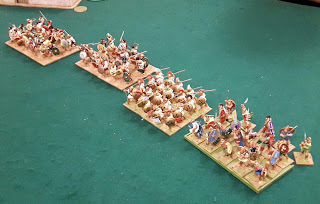 The result was that the Athenians had to close fast, before their heavy infantry came under too much fire. The Athenians had more heavy troops, though of lesser quality, and so hoped to turn the flanks of the Spartans. 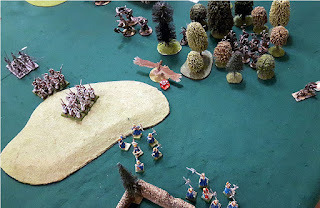 As stated the key way to win; destroy an enemy unit and you have the option to advance, retire, hold or wheel as a follow-up action, and obviously the latter allows you to turn onto the enemy flanks, or cover your own, as appropriate. 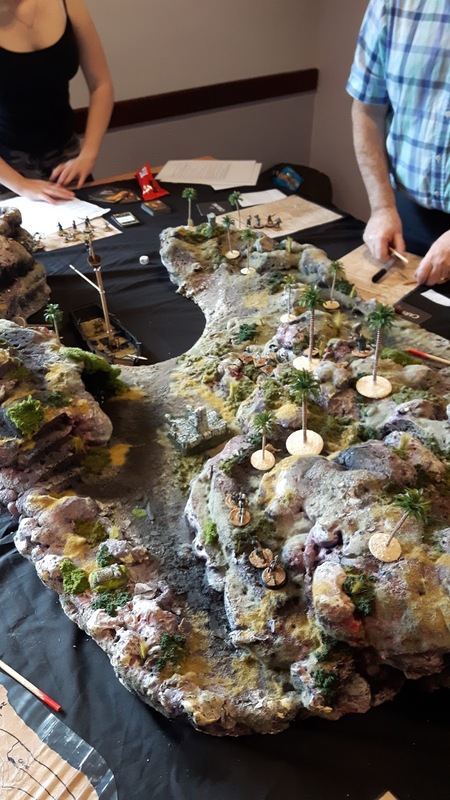 In these elements the simple rules expand into a more intricate game, terrain and opposing units can of course influence every action. At the end of our sixth turn (we failed to roll for a seventh), Sparta held the majority of the ground, though they were under pressure on the ground, having lost more of their infantry than the Athenians, and with troops rolling up their flanks. Another turn may have seen the battle swing either way, of course, and the game was open despite a hard start for the Athenians. The whole thing was played out in under two hours. Which certainly achieved the key design principles of the rules. These are great rules for club nights and those occasions when time is at a premium, as well as tournaments - if you must. In conclusion, we all enjoyed the game; they are not the most historical, or the most detailed rules out there, and I do not know how well they may stand the Charles S Grant Scenario's test*. But they work, are easy to learn and fun to play. Overall they come highly recommended, at least for casual play. 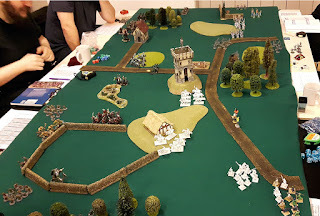 *if the rules allow you to play a scenario out of the Charles S Grant classic 'Scenarios for Wargames' book successfully, without modification, as easily as a standard engagement; they are flexible enough for me! 2016 has not been a great year has it; today I found out old friend and long-time Employer Dave Hewins had passed away last month. Dave ran the local model shop, for more or less the entirety of my life. I first went in the store as an awestruck seven year old, and came out with my first box of Matchbox Commandos. The damage was done and from thence onward D Hewins Models and Hobbies was the place to be allowed to spend time on a shopping trip to town, as I grew older and could travel to town alone, the only place you actually wanted to go. As much as a social retreat as anything. I got to know Dave over time, kinda hard not to when you loiter in his shop for two-three hours at a time, and in due course he offered me a temporary job covering Saturdays in the summer. That temporary work carried on for about thirteen years. As a man he was a shopkeeper in the classic 'Arkwrights' mould (We even persisted with an 'Open All Hours' style till long after the show had concluded), he may never have made staff rich but he looked out for them. As a gamer, he was the sort who you had to watch like a hawk, notorious for rolling his dice when you weren't looking, yet never for arguing. I can't say I had many games against him, save for big group events, but we did play the odd one or two over the years. After I left my home town I would return to the shop periodically to catch up with him and the other old-timers, find out how it was all going. Pleasingly the store weathered the internet age and soldiered on. I last saw him about five years ago at a wargames show, we caught up on how the business was, how his family was. I counted the man as a friend. Indirectly he led to me meeting many of my friends from that time and place. He was more of an influence than I care to imagine! 68 is too young in this day and age. Well given it is less than a mile down the road from me, I went to my first wargames show of the year yesterday and attended the Wakefield gamers' Recon event in Pudsey. Leeds' 'little brother' show (to Fiasco, the bigger, older brother) has always held a soft spot for me, it's tiny compared to many shows, and the games on display tend to be very much of the standard you feel you could put on yourself at home. 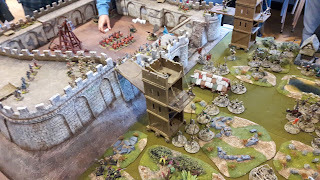 There are few major sellers present, but most of the things you might expect (second hand sellers, stores with hefty discounts on plastic miniatures, book specialists). 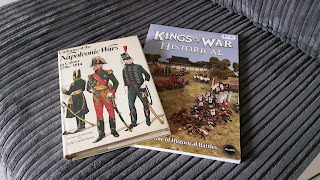 Next year I'd like to put on a display game, I figure my Napoleonics collection is impressive enough to justify it, even if it is just a throw down game with no real basis in History. This time next year I 'should' be free and clear of intrusive study, and have those things called 'weekends' again. In the mean time I hope the show is doing well enough to continue; it's always nice to have something to look forward to in December (it's downhill all the way from here-on-in!! ).